(Newser) – After a leading critic of Vladimir Putin was handed a 5-year sentence for embezzlement yesterday, protests erupted across Russia, prompting a reported 200 arrests. Thousands of people gathered on the main street to the Kremlin, yelling "freedom!" amid honking cars, the Guardian reports. Today demonstrators got their wish, at least temporarily: Alexei Navalny and his ex-business partner, Petr Ofitserov, were set free while the appeal process is carried out, the Los Angeles Times reports. Late yesterday, Russian officials argued that the men couldn't legally be held while their appeal is under way, the Wall Street Journal notes, and the judge agreed with their complaint. 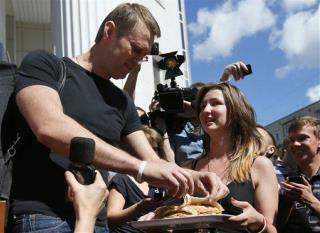 Navalny called the decision "quite unexpected." You can't call Blinchiki pancakes. That's just ignorance. They don't look or taste the same. Russia is headed down a wicked slope towards revolution. If he does not reliquinsh power, the people will take it back from him. Putin is ex-KGB, so anything he does is suspicious...so trumped up charges are not beneath him. leave the guy and freedom of speech alone!